Every year underwater photographers around the world have the chance to submit their images to several categories of the Underwater Photography Competition. The categories have a great variety including “Wide Angle”, “Macro”, “Wrecks”, “Behaviour” “Portrait”, “Compact”, “Up & Coming” that are open to international entries. To promote Underwater Photography (UPY) in British Waters there are 3 categories that are open only to images taken within the UK. Check the winners of British Waters “The Beauty of British Waters – Winners of UPY 2017”. “This is just the 3rd year since the rebirth of the UPY. But the competition traces its routs back to 1965 and it is something that we are really proud of”, states Alex Mustard, who presented they years awards. In this year’s UPY 2017, photographers from 67 different countries participated. So let’s dive into the sea, together with this year’s winners of the international categories and enjoy the images that UPY provided to TheBlueReporters. Winner of the Portraits is Horacio Martinez with “Oceanic in the Sky”. Horacio Martinez from Argentina took this picture in the Red Sea. Oceanics are widespread across entire oceans in tropical and subtropical waters. But they are subject to fishing pressure virtually throughout its range and hence feature on the IUCN endangered list. “This photo is dedicated in memory of Rob Stewart” states Horacio Martinez. Winner of the Portraits is Jenny Stromvoll with “Face to Face”. “This is the first year I’m entering an international photo competition, so I was very nervous but it is so exciting to be with the Compact Category”. She photographed a quite common Gobiidae in the waters of Southern Mozambique but with a different angle. “One of my inspirations is to show different characters and behaviors of the marine life”, explains Jenny Stromvoll. Winner of the Portraits is Ferene Lörincz with “Face to Face”. He photographed a bat fishes and shares the interesting story of how he took this picture since bat fish are incredibly hard to photograph face to face. “I noticed a crevice in the rock, which fish use as a cleaning station. I slowly swam into the gap, switching places switching places with the cleaning fish. This way the bat fish felt safe – thinking only the cleaning fish were there and not turning to see me.” This picture was taken in Shark Rafeen, Rash Mohamed Park in Egypt. Winner of the Behaviour is Qing Lin with “Your home and my home”. 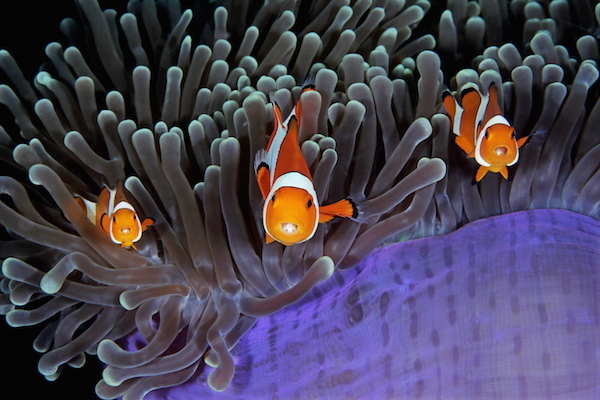 In this picture, one can enjoy the symbiotic relationship of a clown anemonefish and anemones together with a parasitic isopod that likes to hang out in the mouths of anemonefishes. The judges “encourage you to look deeper and deeper into this picture”. 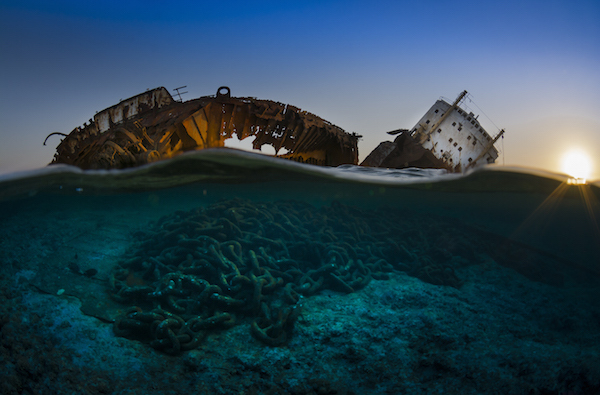 Winner of the Wreck Category is Csaba Tökölyi with “The wreck of the Louilla at sunset”. “This picture was taken in Anilao (Philippines), in this beautiful sea during night time”, says exited So Yat Wai, who recommends Anilao for Underwater Macro Photography. The larvae mantis shrimp (left) even though very small is still a predator that uses its raptorial appendages to hunt. Ron Watkins won the category “Wide Angel” with his picture “One in a Million”. He took the picture in Alaska, where he was actually in search of salmon sharks. “We came across an enormous moon jellyfish bloom that stretched for several hundred meters. The dense bloom of jellyfish ranged in depth from 2 meters to over 20 meters and we spent a lot of time in the water with them. It was surreal and denser than anything I had ever experienced including Jellyfish Lake in Palau. I came across this Lion’s Mane Jellyfish rising from the bloom towards the surface and positioned myself directly over it to capture this image”, Ron Watkins states excitedly. This category is new in this year’s competition of the UPY. Scott Tuason won it, with his book “Black Water – Open Blue”. It pairs together a collection of photographs from open ocean diving, taken around the world either during daylight hours all the pitch black of night. This book captures a wide range of marine life behavior in images that are unique fascinating and often times bizarre. If you want to see some more of this stunning pictures, the UPY team produced a Yearbook which brings together the top 100 images from the 2017 competition. Each picture is featured each with photographers notes and feedback from the judges. ”From my own point of view, I have been captivated not only by the winning images but also by the stories behind how those images were achieved. The conception, the planning, and the physical effort to achieve a successful result; it is those efforts that we, as judges, pay our respects to by taking out two days to meet up, sit together and look in detail at all the images. It is a mammoth task but one that we all agree is a privilege to be part of”, states the Chair of the UPY jury 2017, Peter Rowlands. Interested in entering next years competition? Well, then “there is no need to wait until the last minute to submit your images as you can always delete and re-submit different photos should you change your mind before the final submission deadline” state the committee members. One can check this year’s deadlines online, to have the next years timeline in mind. So grab your camera, take images and submit the best ones to UPY. Who knows, maybe next year you will win the competition and we can see through your eyes the beauty and the treasures of ours seas! If you are not in a competing mood and you just would like to share your underwater photography and experience contact us, TheBlueReporters, and we are happy to work with you on your story.